America saw Eli Broad College of Business alum Joe Johnson go into a “Shark Tank” this past weekend. He came out of it with $700,000 for his startup business. 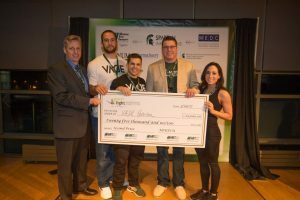 That’s the size of the investment awarded to Johnson (BA Finance, ’16) and his wife Megan Johnson for VADE Nutrition, co-founded by the pair more than two years ago. The cash came during their appearance Sunday night on “Shark Tank,” a reality show on the ABC Television Network that features entrepreneurs as they pitch their startups to “shark” investors in the hope of earning financial and resource investments. VADE emphasizes convenience by producing the world’s first and only portable protein powder. Scooping protein powder can be difficult and messy, and the packaging makes it impossible to take on the go without pre-mixing or pre-measuring into smaller containers. You can watch the episode at the “Shark Tank” home page.